Every year, Samford University’s Department of Theatre and Dance showcases many main-stage theatre, dance and opera productions. There are many behind-the-scenes components of these productions that often go unnoticed. Tucked away in a corner of Wright Fine Arts Center is the costume shop, managed by 2014 theatre graduate Mary Gurney. Gurney teaches students all the skills it takes to work in costumes as they gather supplies, build props, maintain shows, do the laundry, and design and sew the clothes for the actors in the limelight. Gurney has been in the costume industry for 30 years and is a self-taught costume designer who learned to sew from her grandmothers. At the age of 17, she was a member of the dance line at nearby Homewood High School and realized she would rather repair costumes than be on stage. Before her work began at Samford, she owned and worked at numerous businesses in the costume industry. 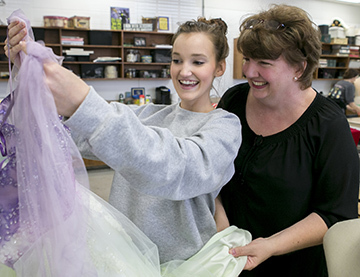 Gurney has worked in the Samford costume shop for nine years, and shares her abundance of professional knowledge and experience with students as a lab instructor five days a week. Gurney manages the costume shop in an interactive nature, allowing students to sew and design as she guides them in the process. Her leadership style allows students to gain valuable firsthand experience. They recently designed costumes for The Crucible, a play based in 17th-century New England, and are finishing projects for the late April performances of the Mozart opera The Marriage of Figaro. While being asked questions about herself, she constantly directed her responses toward the students and gave them the credit.